Videogames, computers, programming, cats, and sleep. It works fine. Make sure you simply don't have the MP interface/names off. Press F11. Hello! 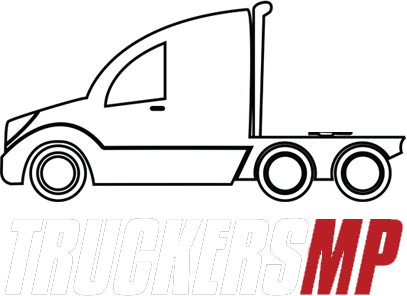 Well every time I try to run TruckersMP I get this message: I found a solution but its a bit annoying... I have to exit Steam, run it as Admin and run as Admin TruckersMP too... weird? This is perfect to buy new DLCs! Good luck everyone! Hola. Para eso, necesitas Apelar la sanción aqui: https://truckersmp.com/appeals Logeate en la pagina antes de entrar Te recomiendo tener pruebas si es posible, Un saludo! Lo que hace el nuevo sistema de reportes es grabar una pequeña parte de cuando fue reportado, el admin lo ve y toma su decisión, no tienes por que ir a la web. Pero yo recomiendo siempre reportar desde la web, por al final, los reportes hechos in-game se borran al cabo de un tiempo. Mira aqui tienes un ejemplo de como trabajan los admins con el nuevo sistema: https://www.twitch.tv/videos/156633430 Un saludo! Hi! Found this post, where there is a list of the Supported Mods Anyway, i think all the Worshops mods are disable when you join TruckersMP. Hope it helps! Oh, by the way, a little tip: Eventually you might come online and notice that there are no jobs for you to take. That's because time is managed by the server. When that happens, all you need to do is make time move forward like in the example I gave. Sleep, take a ferry/train, teleport to another garage, etc. Do that and it will force your client to sync with the server. Once that is done, your jobs market will have loads for you to deliver again. Yep, happend to me later, but as you say I teleported to a garage and then got jobs, took me a while to guess it lol. I just saw a streamer on twitch, mexican, driving like a maniac, trolling, crashing... I mean how can you be so bored? Desconectar el Internet rapido es algo dificil jaja, que haria el f7, llevarte al mecanico mas cercano no?